Libdvdcss is part of VideoLAN project and is used by VLC media player and other DVD player software packages, according to Wikipedia. It's just like a key to the door to let you access to the encrypted DVD without any further ado. So it's a crucial library for some free DVD ripper software that doesn't have the DVD decryption ability like Handbrake. 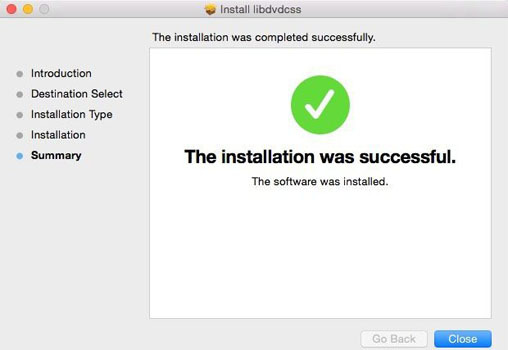 That's why if you want to rip CSS-protected DVD or remove DVD region code on Mac, you are required to download and install libdvdcss on Mac first. Decrypt any kinds of copy-protected DVDs and fast rip commercial DVDs to MP4, AVI, MOV, H264, MPEG4, MKV, etc without any DVD decrypter software or installing Libdvdcss on Mac previously. Mac users use Homebrew to simplify the process of installing command line software like cask, htop, etc and open source packages including libdvdcss on a Mac. But make sure your Mac runs OS X 10.10 or later. If you are new to Mac, check the steps below. Step 1:Open the Terminal application. Step 3: Hit Return > Return > enter password to begin the installation of Homebrew. Step 5: After the downloading and installation, you can follow Handbrake tutorial to rip encrypted DVDs. Note: The libdvdcss is only available for ripping CSS-protected DVDs or making DVD region free. If you want to rip/copy other types copy-protected DVDs like Disney protection, Sony ARccOS, UOPs, etc, Handbrake libdvdcss will not function well, and you should look for other DVD rippers. If your MacBook or iMac is running on Mac OS X El Capitan or later version and you need to make libdvdcss workable on Mac OS X 10.11 for your Handbrake DVD ripping, you are suggested to prepare yourself mentally. The Handbrake for Mac OS X 10.11 doesn't run as smoothly as the one abovementioned. Case 1: El Capitan apparently broke Handbrake ripping copy-protected DVDs. Any clue what to do? 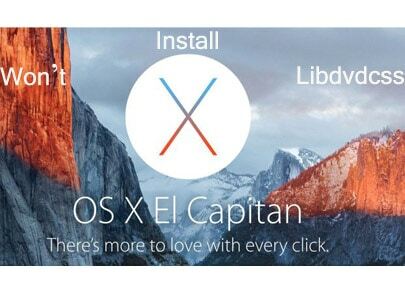 1) Disable SIP and reinstall libdvdcss on Mac El Capitan. FIY: SIP means System Integrity Protection, the new security system for OS X El Capitan. 2) Install a copy via homebrew ( a package manager). 3) Move software library to /usr/local/lib instead, which is not protected by SIP. 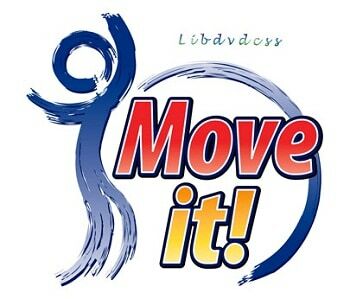 How to move libdvdcss file to /usr/local/lib? • It will ask for your password and should then move it. 1) Downgrade your El Capitan to Mac OS X Yosemite first and then download & install libdvdcss and OSXfuse on Yosemite before upgrading to El Capitan. 2) Generally, /usr/local can't be found on fresh installs of OS X 10.5 to 10.10. When you update operating system from Yosemite (no /usr/local directory) to El Capitan, /usr/local is generated automatically. If not, there might be something wrong with the El Capitan installer or your system. The way to fix libdvdcss won't install problem is temporarily disable rootless, create the directory, make sure the "restricted" flag is not set, and re-enable rootless. Troublesome for DVD Decryption? Here's an Easy Way to Rip Protected DVD? I know you just desire to install libdvdcss on Mac, in hopes that it will aid Handbrake to decrypt and rip DVD to iPhone iPad and take on holiday. But there are so many unexpected troubles, do you feel so exhausted physically and mentally? Besides, Handbrake libdvdcss only can rip CSS-protected DVD and remove DVD region code. To smoothly decrypt other copy-protected DVDs, it's advisable to look for a self-contained DVD ripper for Mac without libdvdcss aids. 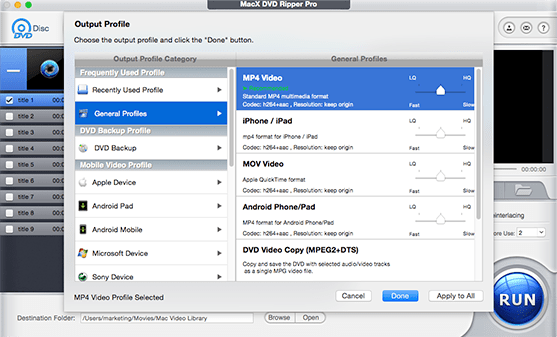 Here the high-end MacX DVD Ripper Pro is the independent DVD ripper to enable you decrypt and copy DVDs to iPhone X/8/7/7 Plus/6s/Plus, iPhone SE, iPad Pro, Galaxy S8, HTC 10, Sony Xperia Z5, etc. without any plug-ins or add-ons. With the advanced DVD decoding/encoding engine, title check mechanism and unique DVD analysis techology, this top Handbrake for Mac alternative can rip encrypted DVDs with aplomb, no matter the CSS, Region Code 1-6, RCE, UOPs, or Sony ARccOS, Disney Fake. 36X faster speed guaranteed, thanks to the utilization of Intel QSV hardware encoding tech, thus there's no need to wait a cup of tea time. 1Import DVD by Clicking "DVD Disc" or "DVD Folder" button. Free download this great DVD ripper alternative to Handbrake on Mac and then fire it up. Click "DVD Disc" or "DVD Path" button to load the DVD on your MacBook, iMac 4K/5K Retina, etc. This DVD ripper for Mac will take a few seconds and automatically choose the right title without the aid of libdvdcss. 2Choose Output Format or Mobile Device. From the pop-up window, pick up the output video format for mobile device you need. You can choose to rip any new DVD movies to MP4, MKV, MOV, AVI, etc. almost all the video and audio formats. Of course, the Apple, Android, Microsoft handheld device profiles are also available for you. 3Opt for a Destination Folder to Save Output Files. Find the "Browse" and click to choose the output folder. 4Start Copyright Protected DVD Ripping Now. Click "RUN" button and this DVD decrypter's decoding engine will start to decode and rip DVDs on Mac. Just a few mins, you can eventually get your digital copy of DVD movies in 1:1 ratio. After finishing the work of DVD ripping, you can use MacX MediaTrans iOS mobile transfer to copy videos from computer to iPhone iPad iPod for playback on the move. Besides, this iPhone transfer also can aid you to easily manage files on iDevices like music, photos, eBooks and more. Ripping encrypted DVD with HandBrake libdvdcss.dll not working problem? 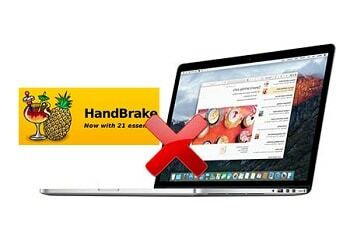 Handbrake error with libdvdcss is fixed with detailed guide on Handbrake 64 bit libdvdcss download on Windows and Handbrake libdvdcss Mac (macOS Sierra) download. Hanker for an AnyDVD for Mac alternative to get good DVD conversion done on Mac OS X? Well, this guide provides an awesome AnyDVD alternative for Mac, so that you can rip copy protected DVD movies to Mac's hard drive and rip them to iPhone, iPad, iPod, etc. MacX DVD Ripper Pro is an independent DVD ripper to decrypt and rip copyright protected DVDs on Mac without handbrake Libdvdcss involving. And it can also make a digital copy of Disney DVD, Sony DVD to MP4, MKV, MOV, AVI, ISO image, MPEG-2 with no quality loss.